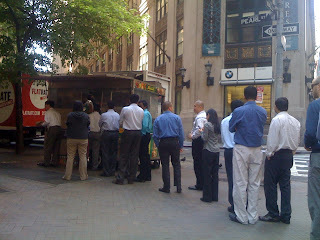 Food trucks are mobile kitchens hosted in the back of a truck or van. You've likely seen them at sporting events, concerts, college campuses, or even near your job. Or perhaps you're more familiar with their smaller cousin, the food cart—the hot dog and ice cream vendors in the park, for example. Street food vendors have likely been around for ages—as long as people have been traveling, as long as there have been market spaces, there has probably been a street food culture. An early version of the food truck was military field kitchen, which was carried by troops in four wheeled wagons that that were adapted into chuckwagons by civilians. But I have seen prepared food sold out of push-carts (see "Rice and Beans" on my Research page for more details.) Today, there is enormous variety in food truck fare. In the southwestern United States, particularly Texas and California, "taco trucks" serving Mexican foods are immensely popular. 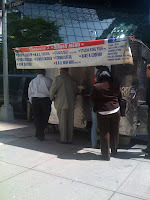 In the northeast, Chinese, Vietnamese, Thai, Indian, and a variety of other ethnic foods are available from food trucks. In my neighborhood, I've also seen a barbecue truck, burger truck, and a vegetarian truck. They're fierce competition for local sit-down eateries because "platter" lunches cost about $5.00 or $6.00. For the budget-conscious, they're a definite deal. In New York City, food trucks offer a small taste of the world, without the added expense of airfare. Often manned by immigrant families, food trucks serve up a small piece of their culture. For example. the Halal vendors service up chick en or lamb over rice, and one Indian cart New York's Financial District serves up fresh biryani and kebabs. There was also a local Trinidadian truck, serving stew chicken, curry chicken or beef with roti, currance rolls, and Solo drinks. (Solo is an extremely important food identity item for Trinidadians, but perhaps I'll save that for another post.) The Trinidadian truck succumbed to fierce competition from a Jamaican truck, however—the spicy jerk chicken drew customers away from the festively decorated red and black Trini truck. Hungry tummies can also find gyros, pizza, sandwiches, even Banh mi, if you're willing to look. Do you frequent a lunch truck or cart? Why or why not? What are your favs? Share below. Ah, the street vendors! Whenever I travel I like to try out the local variations. In Seattle I was in love with the scallop carts. In DC it was the bratwurst. For some reason I have never tried a truck/cart in NYC. The few times I get there I'm always so eager to walk down Lexington menu browsing that I never seem to stop for the lunch trucks. The only thing that can be legally sold from tucks and carts in Chicago is food that is prepared and packaged elsewhere and simply distributed onsite. So, mostly it's tasteless crap. That's a pity for a city that is in part known for food. There are a couple of local chefs, though, who are trying to get the old codes relaxed. Hopefully in the next month or two we may see a resurgence of the art here as well. I was reading about a similar food cart drama around the taco trucks in LA. It's a shame because it's an interesting (and usually fresh) food source. Here's hoping you get your street food back!